Preheat oven to 400°F. Place Reynolds® Oven Bag in 13x9x2-inch pan. Add flour, 1/2 teaspoon salt, 1/4 teaspoon pepper and lemon juice. Squeeze bag to blend seasonings. Spread pesto on salmon. Sprinkle with remaining salt and pepper. 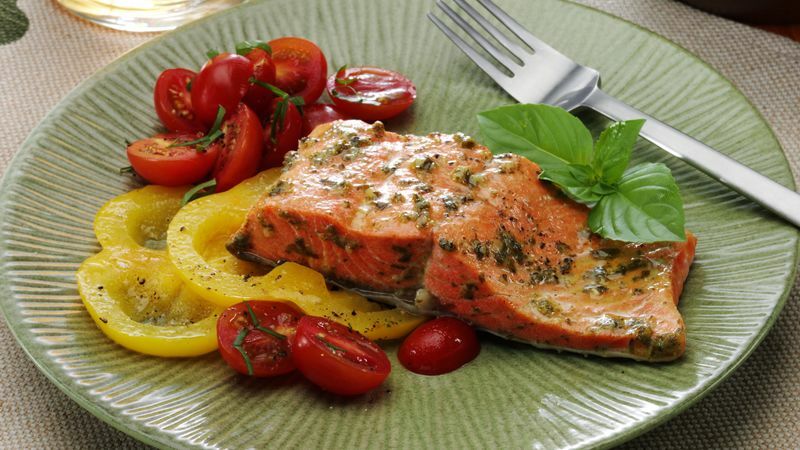 Place in oven bag in a single layer; arrange tomatoes and bell pepper strips around salmon. Close bag with nylon tie. Cut six 1/2-inch slits in top. Tuck ends of bag in pan. Bake 15 to 20 minutes or until salmon flakes. Let stand 5 minutes. Carefully cut bag open to serve. Garnish with fresh basil and lemon twist, if desired. Reynolds® Oven Bag Tips: • Substitute one 1 to 1 1/2 lb. whole salmon fillet for the four cut fillets, if desired.